You do not need to be certain gemologists to know what we talk about when naming a diamond. The precious stone for excellence, the gem certainly best known even among non-experts. That is mounted on a pendant, an engagement ring or a gift for a milestone birthday, almost all in the course of our lives, sooner or later we come in contact with this stone. But not everyone know the characteristics and the different properties that this stone owns and which help to give it its incomparable charm. Some of you will ever go to the disco or under the tanning lamp and see your own ring emit strange glows. There is no cause for alarm, it is not synthetic or imitation diamond but, as opposed, you are faced with phenomenon quite natural. 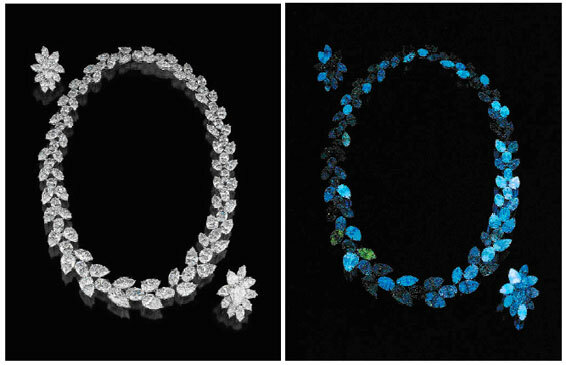 The fluorescence is indeed a natural phenomenon that affects approximately 1/3 of the diamonds used in jewelry and is the property of the stone to emit visible light when exposed to UV ultraviolet rays. Depending on the intensity of the re-emitted light, they are determined by means of touchstones, five degrees fluorescence: nothing – low – medium – high – very high. 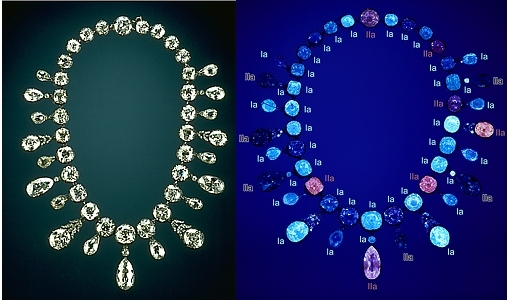 Although most of the fluorescent stones have a blue color, from faint to intense, they are also present diamonds with pink fluorescence – red. So even if not immediately perceived, the fluorescence is an important feature that determines the appearance of the stone and the way it appears to our eyes. 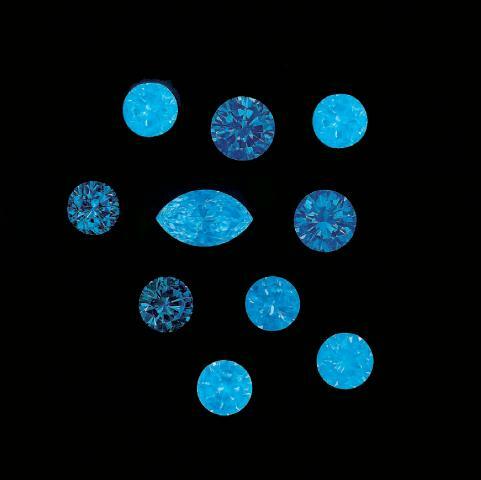 For a diamond tending a bit ‘to yellowish, a light blue fluorescence can considerably improve its color and can thus be considered almost an added value. In contrast, a very strong fluorescence can get to make it appear milky and just pleasant to the eye, even the whitest diamond. 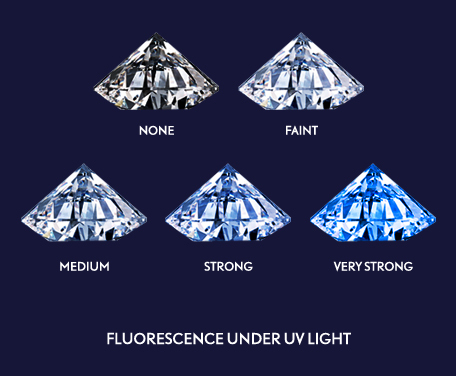 Ultimately we can consider the fluorescence as a feature to keep in mind almost exclusively when you buy a stone for investment, while the majority of diamonds are sold to celebrate an event or to stop in time a special moment and then to be worn and make us happy !